Saturday 3. I have organized my own mess again, I got tired of negroes, they are so very slow, and do not do their work properly. I have a white man to do my cooking now, I think I will like this new arrangement a great deal better. The negroes after they get somewhat acquainted with their masters become too independent too insolent and indolent, so that there is no getting along with them. My black servant Aleck went to New Orleans this morning. 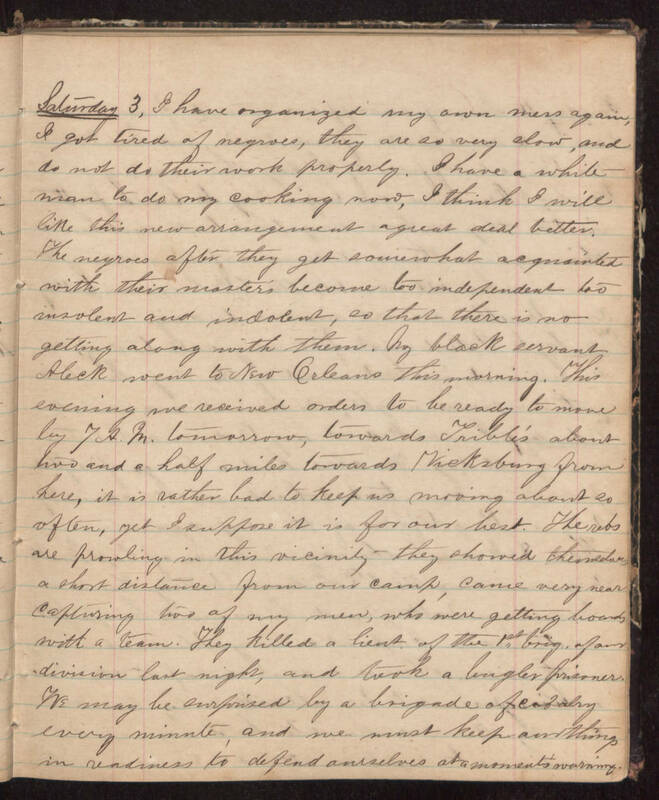 This evening we received orders to be ready to move by 7 A.M. tomorrow, towards Trible’s about two and a half miles towards Vicksburg from here, it is rather bad to keep us moving about so often, yet I suppose it is for our best. The rebs are prowling in this vicinity they showed themselves a short distance from our camp, came very near capturing two of my men, who were getting boards with a team. They killed a lieut. of the 1st brig. of our division last night, and took a bugler prisoner. We may be surprised by a brigade of cavalry every minute, and we must keep our things in readiness to defend ourselves at a moment’s warning.